Putney train station is just across the road. 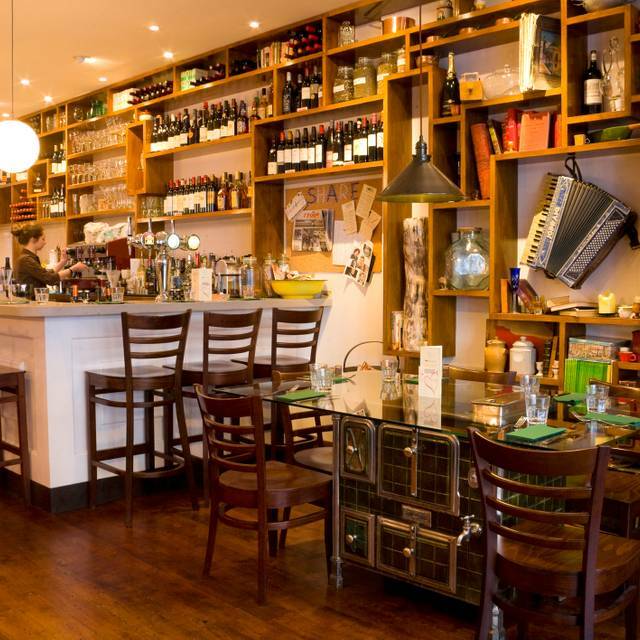 East Putney tube station is 2 minutes walk from the restaurant (turn left when you exit the station). 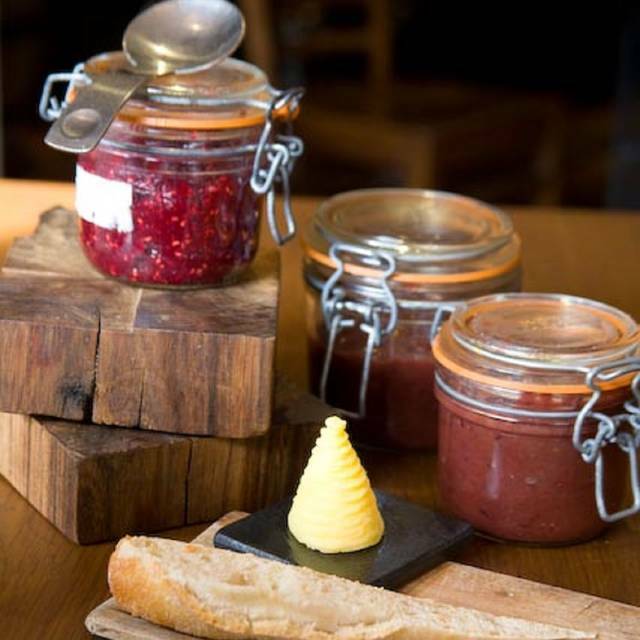 London's most authentic French Brasseries with 2venues in the capital, GAZETTE captures the essence of local French village cafés with a commitment to fantastic seasonal food, wine discovery and true hospitality all served in comfortable informal surroundings from breakfast through dinner. GAZETTE was originally born in Battersea in 2007 and had a gentle expansion with the opening of the Putney branch. 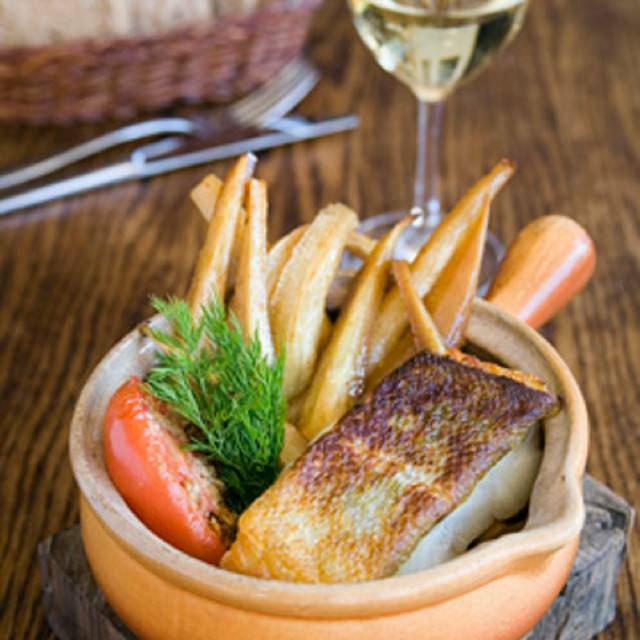 GAZETTE is described by owners Pascal Even and Walter Lecocq as a rural style of French brasserie, one you’d find in Provincial areas of France. 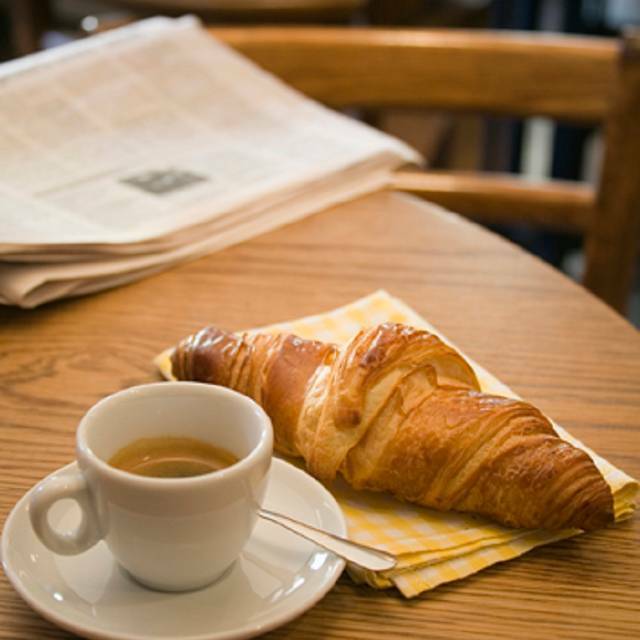 Both want it to reflect the spirit of local French cafés and offer a cuisine that is simple, generous and vivacious, with lots of daily specials and on-going food events, and where transpires the warmth and cordiality of true French cuisine. Sparkling wine with strawberry "crème & purée"
My partner and I and his mother came here on Easter Monday and found the staff as efficient and friendly as ever. The morel mushroom dishes were wonderful too. It's so exciting to know that there will be a different seasonal ingredient each fortnight. You know what it's like when you have to book a restaurant somewhere to meet some friends and you're taking a bit of a punt? What if the kids don't like the food or if the menu doesn't have enough variety to suit the different tastes. Or maybe there's just too much choice, which in my experience can mean a fairly standard rather than exceptional experience as the kitchen gets spread too thinly across cuisines. Seconds after entering Gazette Putney all of those fears were put to rest. The menu had old favourites and some more exotic choices, the resulting meals were uniformly delicious, the wine, coffee and deserts were equally excellent and the service was prompt and efficient. If you're writing a review and your only criticisms can be that perhaps this sauce was a little thin (for your taste) or that chocolate desert was a bit too chocolaty (for me) then you're onto a good thing. Food was delicious and services was friendly and prompt. 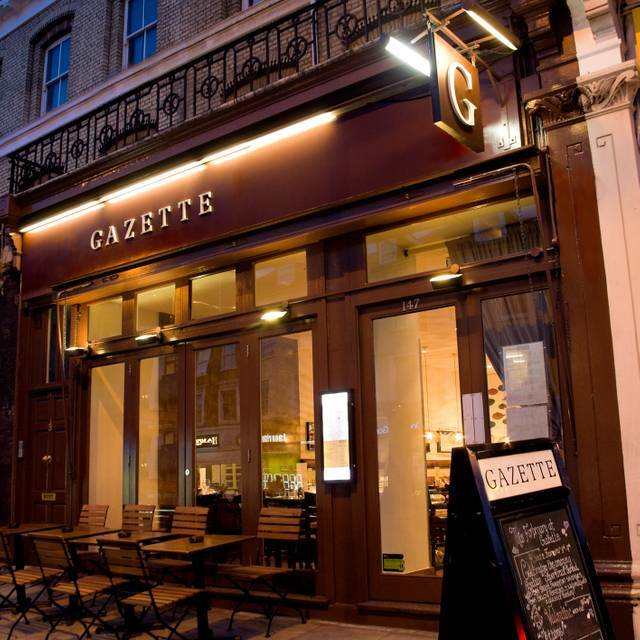 We are very fond of dining at Gazette which we consider to be our local. We were as always warmly welcomed. We had a lovely red wine, the appetisers were tasty, my husband fish was very good and well cooked but my mussels were not wonderful as they were tiny and rubbery which is unusual as normally they are great and plump. We will still continue to go though and recommend it as it’s a lovely local eatery. I chose white asparagus which were really hard and tough. No flavour. I also had mussels that didn't taste of much either. My Husband's and son's s steak were chewy. Great food as always but the service was a bit haphazard but I think they'd been run off their feet with Mother's day lunches. The first thing I need to say is I love the food here it’s amazing. The flavour and quality is very good indeed. However of late, more often than not the service is diabolical. The food is good but my patience with horrendous service and the bad attitude is wearing thin, next time this happens I will refuse to pay the service charge as lately it’s quite frankly an insult. I used to visit twice a week or more but now I visit perhaps once every other month. It’s sad as it used to be a delightful little place to eat and entertain friends. I have previously left glowing reviews but I just can’t put service down to staff having a bad day any longer! Thank you for taking the time to write a review. I am very disappointed to hear about your bad experience at Gazette. As per your numerous experiences at Gazette, you know our sense of hospitality and quality of the food, and so you realise that we often succeed in making the experience special and ensure people return. Sadly it is not always the case and certainly wasn't the case on this occasion as much as we try to be consistent. Do accept our full apologies. Second meal at Gazette Putney. Food very good, especially the puddings. Decent value, too. Thank you so much for taking the time to review us and a great score, we’re glad you’ve enjoyed your time with us at Gazette Putney. We’ll keep an eye on the wine glasses ;) Sorry! Food and service were excellent as always. Thank you so much for taking the time to review us and for giving us a 5 stars all round. We’re very grateful and looking forward to seeing you soon. Hi John, Thank you for taking the time to review us and pointing to us some issues you had, all noted. We hope to see you soon so we can hopefully make it up to you. Very noisy for a Wednesday evening, service a little slow (we ordered drinks.. they still hadn’t come by the time we ordered our food 15 mins later) but beautiful, beautiful food! Would recommend! Beautiful food , very good service. We enjoyed our meal very much and already booked again. Fantastic service and delicious food. We've been a couple of times now to Gazette Putney and this was the best. Although very noisy, we had an enjoyable lunch and the staff were friendly and worked incredibly hard throughout. We will be coming back to try more of your tasty, improved menu. 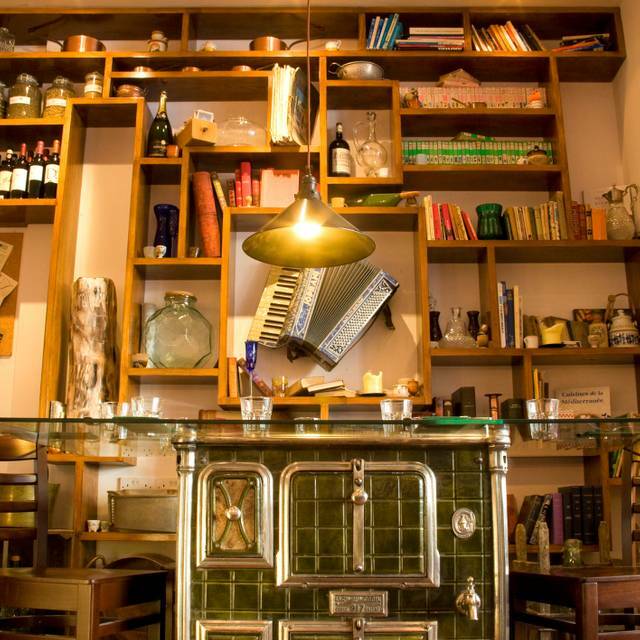 Authentic French Brasserie with great traditional dishes. Accommodates children too and it is a very relaxed venue all round. Specialities include Moules, Offal and Game when in season. 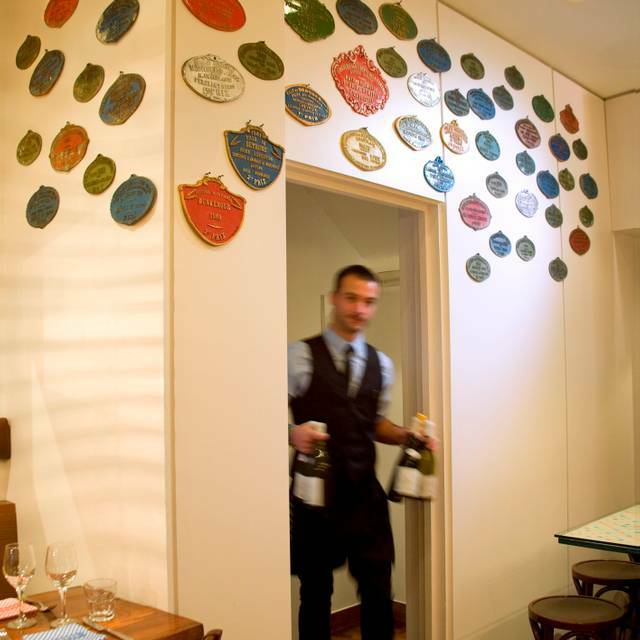 Great wine list incl. Gazette's own vineyard and highly affordable. Could try to offer more wonderful desserts and dessert wines. Very happy. Hi, Many thanks for taking the time to review us. We’re glad you’ve enjoyed your time with us at Gazette. Very much looking forward to seeing you soon. High five from the entire Gazette Putney Team. Nothing special. 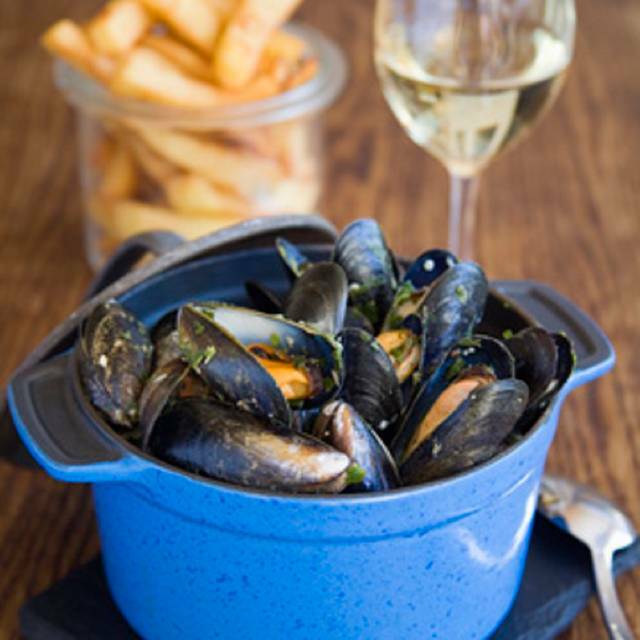 I have ordered mussels / moules mariniere, because this is a Belgian/French cuisine restaurant. There was a very little sauce at the bottom; no flavor at all. Just steamed or boiled mussels. Unfortunately; didnt meet my expectations. Everything was great! We had a great experience and stayed eating and drinking for over 4 hours. Lovely staff who went the extra mile to make a birthday dessert for my sister. Food was delicious and staff were great at offering advise on options. I would go again, and I now know why it's my sister's fav restaurant in Putney! 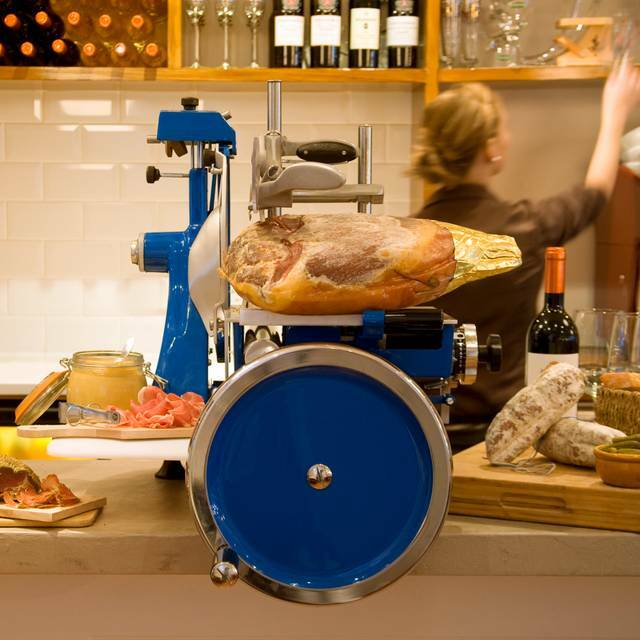 We always love it at Gazette - lovely meal, great food and good service. And the espresso martinis were a fab end to the meal! Nice to see local authentic French cuisine in this price range. Putney continues to have a poor selection of restaurants and Gazette does not change that. Also, small portions. Great little bistro offering a peaceful haven one minute from Putney High St. Great quality food, smallish portions but always good. Made a reservation after reading some good reviews about Gazette Putney. When we got there, they told us to sit wherever then the waitress came over. Before even saying "hello" or asking about drinks, she told us the table had a time limit because of another reservation. Would have been fine if they place hadn't been nearly empty or if they hadn't told us to sit anywhere or if she had been a bit more polite about it. Overall, service was sub-par. Food was room temperature when it came out and the poached eggs were a bit over done. Earl Grey tea was weak. Only redeeming factor was the Madeleine I was served. Came in on a Friday night with my girlfriend. Had a lovely evening, treated very well by the waiters. Food was fantastic, if a little pricey. Would definitely return. Quantity and quality of food is excellent and enough variety for some return visits. Staff were accommodating with just the right amount of friendliness and courtesy. Excellent friendly service and good quality food! Really enjoyed being back on the Scrabble table again too! Lovely service and great food. found the prices quite high versus other places in the area, but overall nice experience. Good atmosphere, staff very friendly and helpful. Poluet Bretton and Steak Bavette excellent, with a good selection of wines at various prices. Loved the tables that allowed you to write on them like draft boards!! Overall a very enjoyable evening. Hello again. Two unfavourable reviews in the last month or so from me but the food was miles better this time around. A competent chef back in the kitchen and the duck was delicious. Spinach and garlic side nicely wilted as well. Not sure why if there are cocktails on the menu that the bar staff have to read the recipe for same? Possibly the worst mussels I have ever eaten and the worst example of French food. This restaurant used to be a real favourite but quite frankly I will never return. Great service but the food was not as good as the last time I went there. Snails were average and the duck was very chewy. We had a super evening. Food very good. Just would like a Viognier white wine on the wine list! I used to visit the Gazette in Balham so the one in Putney is the closest one. The food and service still excellent and my french friend told me that the food is very authentic. The food was very nice and we were treated very well. We had a trainee waiter though who got a few things wrong, but I’m sure he will get better. We had a delightful evening with American friends. All 8 diners were happy with all their food, and we were particularly charmed by being out in a separate quiet room to accommodate the member of the party who is severely hard of hearing. Thank you for your consideration.